Jewels that tell the shapes of nature, the imaginary, which arise from the myths and dreams to create new forms and absolutely perfect. The new collection of jewelery by De Beers “Imaginay Nature” tells a fantasy world, where natural forms meet with the myth and beauty. Otto jewelry, unique pieces, where the splendor of diamonds bends in the sinuous lines, tell the metamorphosis the natural world. From Ovid to the present day, the new collection of De Beers is based PRECISELY on the move, one that brings every element of nature to change Himself into a spiral of beauty. The brand has been inspired by the diamond, real muse in this case for the creation of eight pieces that tell the craftsmanship of jewelers in shaping forms and light. The jewelry diamonds are among the absolute must for Those Who love the precious: there are cases in cui only the stone to be a leader as in the case of the creation of Shawish Jewelery, jewelery Geneva who Entirely made of diamond ring, a ‘only patiently carved stone to become a complete gem. We are talking about creating a unique, as indeed are the pieces of the collection De Beers, founded “to create a language of movement and fluidity”, as Explained by Hollie Bonneville-Barden, a designer who has made the collection with Raphaele Canot. 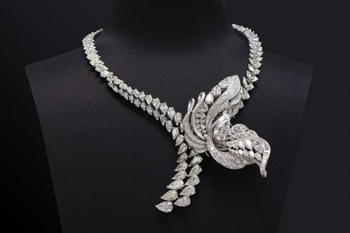 Eight jewels “Imaginary Nature” with a diamond brooch features a 16:38 that carat pear shaped shaped forms with the wind, as well as diamond earrings curving remember feathers and waves, passing through the rings “winged” with 4.11 carat diamonds that seem to want to fly. The collection is inspired not only by nature and its changes but also at the same metamorphosis inherent in the diamond stone that needs to “bloom” from the raw been to perfection under the hands of the experts of the house.